In the mood for a small town Southern romance complete with fried pickles and beauty pageants? Have I got the book for you! Emma Laroux has a past, a past not even she can account for but for which she's been paying ever since stepping down as Miss Alabama nearly a decade ago. All she can say is love isn't an option for a scandalized beauty queen from Ministry, Alabama. Matthew knows being sent to small-town Alabama is one of the worst things that could have happened to him, not just for his career, but because, since being from a town so similar and close to Ministry, the panic attacks he's had since his deployment seem to be occurring with more frequency. But then he sees the infamous Emma Laroux with whom he shares a past secret...a secret about which she, herself, doesn't seem aware. If he tells her, will it ruin the budding relationship between them? On the other hand, will his new-found feelings for her allow him to keep such a thing to himself? If only small towns, and everything to do with them weren't so complicated. 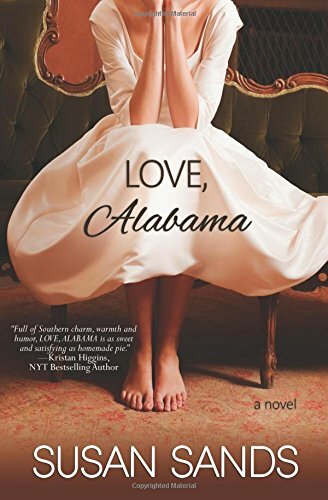 LOVE, ALABAMA is a solid sophomore offering from Susan Sands mainly because the South is lovingly venerated in very capable hands. There is something to be said about authors with such a keen sense of setting that it becomes as important to the story line as its hero and heroine. Sands does that for Ministry, Alabama. And whether Ministry truly exists on the map or not, it exists in readers' minds because it is so vibrant on the page. In fact, so integral is it to Sands' story that it not only provides the flavor to everything from food, small town politics, and manners, but also for the main conflict. Both the characters are from small town Alabama yet only one of them is letting on. Why? I can't say. Don't want to ruin the story for you. But every description of place is worth the read to find out. As for the characters, it is a subtle chemistry between the main characters Sands has crafted. And in a world of in-your-face romantic play, LOVE, ALABAMA is a refreshing change. That said, many readers may find it too subtle for their tastes. In terms of the pacing, I found a good portion of the book much like swinging on a porch swing...that is until it kicks up in the last section so that you're nearly breathless from speed reading. Personally, I think Sands has a lovely career ahead of her. Pick up LOVE, ALABAMA. If you've never lived in the South you could almost say you had after reading this book. What is your favorite thing about the South? As a Northerner myself, I'm a fried pickle and southern manners convert. Good review, J! I haven't read this one yet, but I liked Again, Alabama. Since I'm a Southern chauvinist be birth and a Southern literature specialist by education, I have an abiding affection for romance with a Southern setting. I look forward to Emma's story. That would be "by birth." And I can't even blame Autocorrect; it's just my poor typing. Thank you. As Janga above says, "I have an abiding affection for romance with a Southern setting." What I love about the South is sweet tea, biscuits, and pies. Since I am from Ohio, the south has become my home after 38 years. I agree. No one does sweet tea, biscuits, and pies quite as well! This sounds like a wonderful book. Will add to my TBR list. When we travel south, the food is fried or BBQ. Now the desserts are all sweet as is the tea. Diabetic coma for me. You won't be sorry about the book... you may be sorry about the tea. Best things about the South? Southern comfort - and other, not always fried - food, and Southern manners and friendly attitudes. I'm the waver in my community. When I do it when my Yank-born dad comes for a visit, he always asks, "Do you know them? Why are you waving at them?"